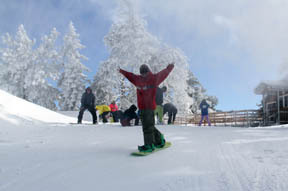 Wrightwood, CA – November 5, 2011: Winter has officially arrived in Southern California. A strong, early-season storm left 4 to 6 inches of new snow yesterday and Mountain High was able to make enough additional snow overnight to open today at 12pm. This makes Mountain High the first area in Southern California to open for the 15th straight year and the second in the state. Operating hours are now 8:30am to 4pm daily with night skiing scheduled to begin Thanksgiving weekend. Early-season rates are just $45 for adult (reg $69) and $25 for children ages 7 to 12. Kids six and under ski free when accompanied by a paying adult. Due to the reduced terrain, ticket sales will be limited so guests are advised to arrive early for the best experience. Up to three lifts are currently available accessing a fun selection of beginner and intermediate terrain. Several terrain features are on the mountain as well for freestyle skiers and snowboarders. 100% of the open terrain has been groomed and the coverage is good with an 8 to 15 inch base of fresh, machine-made packed powder. All amenities such as rentals, retail, and repair are available however the Winter Sports School will not be offering lessons until the resort has the necessary teaching terrain.